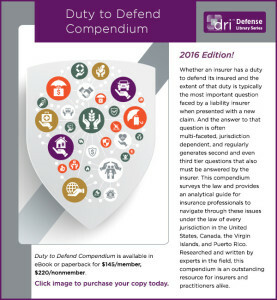 DRI has honored Mike Mills by selecting him to contribute to its 2016 Duty to Defend Compendium. DRI turns to it most respected members from across the country to author state-specific sections to all of its Compendia. Mike Mills was selected to author the Nevada section of the 2016 Duty to Defend Compendium. A full copy the Compendium can be ordered from Duty to Defend Compendium . Feel free to preview the Compendium by CLICKING HERE. All DRI Compendia can be purchased through the DRI Store.